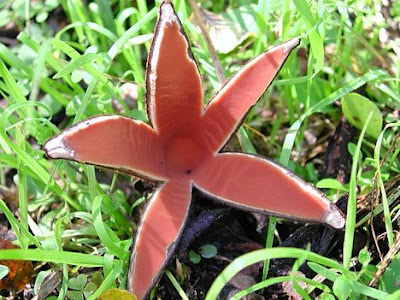 This is the devil's cigar, chorioactis geaster, so called because it rises from the ground like a dark cigar before splitting radially into four to seven leathery rays. This split is often accompanied by a malevolent hiss as this rarest of mushrooms spits out a smoky cloud of hungry spores. Ok, so that's fairly cool in and of itself, but this mushroom's physical characteristics are only a fraction of its awesomeness. The fullness of its coolness, at least in my opinion, comes from the places that it grows. The devil's cigar only grows in a few remote locations on the planet, and they just happen to be separated by 6,800 miles and the Pacific ocean. In three isolated sites in Japan, these mushrooms grow on the stumps and dead roots of oaks. In a few counties in Texas, they grow on the stumps and dead roots of cedar elms. That is the same exact organism, feeding on two entirely different food sources and separated by the largest expanse of open water in the world. They've been separated this way for at least 19 million years, so that pretty much rules out human intervention. People like to propose theories in situations like this, when the natural world shows us something so wonderful and strange it makes our brains hurt, but I just don't feel that need. Instead, I'll just end the story here. You have questions? That's good. May your life be always filled with more questions than answers. In the February 2010 issue of Scientific American, a marine biologist wrote about the hundreds of species of animals that live at the North and South Pole, and nowhere in between. Same species, opposite ends of the Earth, and no adaptive radiation. It turns out that there are underwater "tunnels" of extremely cold water that connect the poles under the sea, and the microscopic animals have been continuously criss-crossing the ocean, keeping the genetic line intact. I wonder if there is some equivalent for the fungus? That is indeed some fascinating information. As far as I can gather, the only worthwhile theory for the two disparate locations of the devil's cigar involves a similar process. Both locations are on the same latitude, so the theory is that Asian dust clouds probably carried spores across the pacific. I know it's silly, but when I saw the first picture I thought I was going to be reading about a man eating mushroom. I have never seen anything like that before. The earth is filled with wondrous creation. Thanks for sharing your knowledge with us.